Trek Ultra provides up to 12 hours protection. The length of protection provided is dependant on a variety of factors including perspiration and activity. Apply up to twice daily in the morning and early evening. Regarding the spray application, due to the addition of using advanced micro-encapsulation technology for this DEET spray, the viscosity of the spray is slightly thicker, which does require you to apply Trek Ultra onto the palms or backs of your hands to spread the insect repellent over exposed areas of skin. The micro-encapsulation is used to allow you to use a lower strength (%) of DEET but be effectively protected for up to 12 hours, whilst also increasing resistance to sweat and splashes. Therefore, applying this spray is similar to how you would apply moisturiser or suncream. 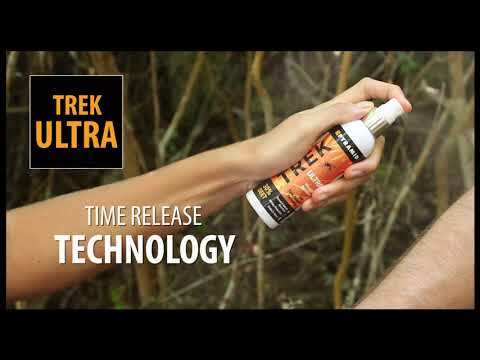 For application of Trek Ultra onto your face, we recommend not spraying directly onto your face, but again spray a small amount onto the palm or back of your hand and lightly pat onto your face. Take care to avoid the eyes, mouth and palms of the hands that could cause ingestion of the product. See more on How to Use Pyramid Repellents and Mosquito Borne Diseases. Tropical strength with low DEET! When should I use DEET over Saltidin®? Both Saltidin® and DEET are highly-effective insect repellents recommended by WHO. However there may be times when DEET is necessary, or specifically recommended by travel health clinicians. DEET insect repellents are considered to be the most effective type of repellent for use in high-risk malarial areas. Our DEET insect repellent range offers long-lasting protection up to a maximum of 12 hours. It is an excellent choice if travelling for long periods in high-risk areas, for example using Trek Ultra, which provides a slower release of repellent vapour, so reducing the need for reapplication. Can I use DEET on my children? Yes, both our Trek Ultra and Trek 20 DEET spray repellents can be used on children from the age of 2 and over. Our maximum strength repellent, Trek 50, contains 50% DEET and should only be applied onto children from the ages of 12 and over. Is it safe to use DEET repellents while pregnant? Most people won’t have any adverse effects when they use Trek DEET as recommended on the label, although always treat with caution when using a product for the first time. For pregnant and breast-feeding women, we advise that it is suitable to use a DEET repellent that contains up to 50% DEET such as Trek 50 or Trek Ultra. Alternatively if you would prefer to use a DEET-Free repellent then Trek Sensitive is the best option. Always take sufficient supplies of mosquito repellent with you, as in some coutries with Zika virus there is a shortage.